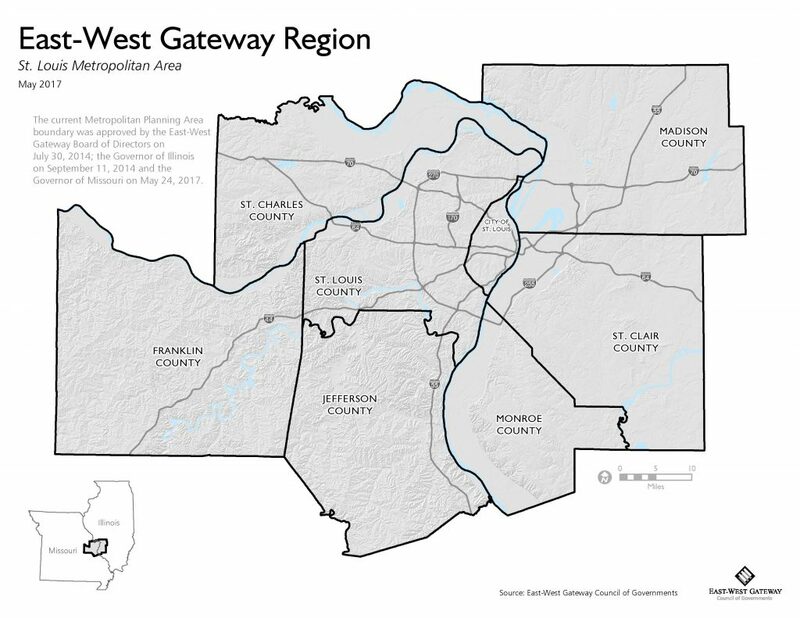 As a metropolitan planning organization (MPO), East-West Gateway Council of Governments (EWG) is responsible for implementing the metropolitan transportation planning process for the St. Louis Metropolitan Planning Area (MPA). The St. Louis MPA covers the bi-state St. Louis region and includes the city of St. Louis and Franklin, Jefferson, St. Charles, and St. Louis counties in Missouri and Madison, Monroe, and St. Clair Counties in Illinois. Click on the map below to view a larger version in pdf. The Transportation Management Area Planning Certification Review (Certification Review) is conducted every four years by the Federal Highway Administration (FHWA) and the Federal Transportation Administration (FTA) to ensure that EWG, as an MPO, is meeting the metropolitan transportation planning process requirements. In early 2017, FHWA / FTA completed EWG’s most recent certification review and issued the 2017 Certification Review report. Looking for Certification Reviews from Prior Years? EWG’s Library contains important agency documents including those from prior years. Use the link below to access the Certification Reviews for the four-year periods from 2001 through 2013. Contact EWG staff by phone at (314) 421.4220 or (618) 274.2750 or by email at info@ewgateway.org.